There are many types and operators to search mails within Gmail. Many advanced users do use various operators that find out the specific mail according to size, date, user and sub operators like larger than, smaller than the specified size, before or after the specified date and many other tricks to find the exact email from your GMail archive. But all this is really a tricky way and you have to remember all those tricky operators and their exact way of use. Now you do not remember all that. Gmail has released an easy to use search function. 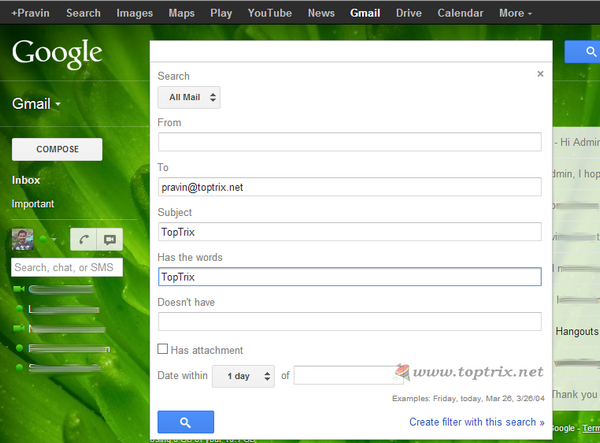 The advanced GMail search tool provides option to search mails for specials sender. You can search for the 'From' and 'To' field. 'Subject' field allows you to search for specific words in 'Subject' line. 'Has the words' and 'Doesn't ' allow you to find an email containing specified word and exclude the email with doesn't have. You can specify the range of date with 'Date within'. Tick 'Attachment' to search emails having attachments only. You can search any specific label to weed out unwanted results. Do you need any extra operator even after this tool? Which operators you were using previously?